It is important for Volunteers to know exactly when their prospects have made a gift so that they can follow up with a Thank You and keep the conversation going. 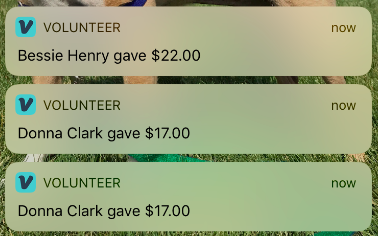 EverTrue's Volunteer Gift Notifications will help them do just that! *If you'd like to enable Volunteer Gift Notifications for your institution, please email genius@evertrue.com. 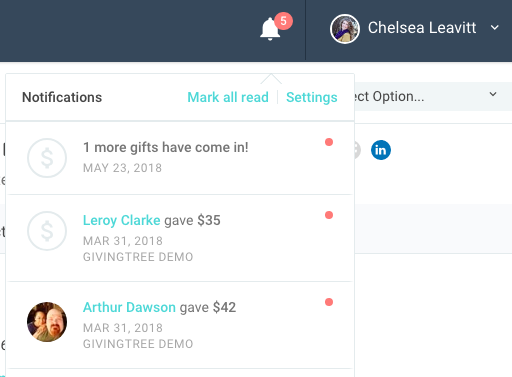 EverTrue will send a notification to the volunteer when a gift is made by one of their assigned prospects. To do this, we monitor any change to a prospect's last gift and last gift date, which comes from your institution's constituent data import. If the prospect is from a volunteer pool that has been configured to use a giving category, the notification will be generated based on a change in that category only. If no giving data is selected for that pool, no notification will be sent. The gift is within the past 90 days. The gift is new (and has not been previously imported). The gift does not have a future date. 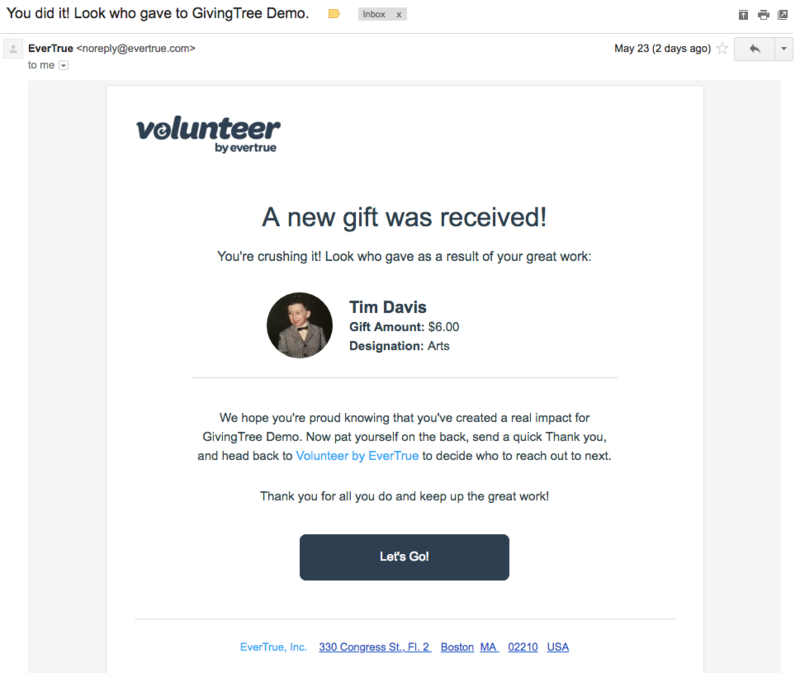 Volunteers will be notified via email, an iOS push notification, or an in-app notification (or a combination of these) when a prospect who is assigned to them makes a gift. Volunteers can manage their subscription preferences in the Volunteer web portal by going to the bell icon in the upper right corner and selecting "Settings." 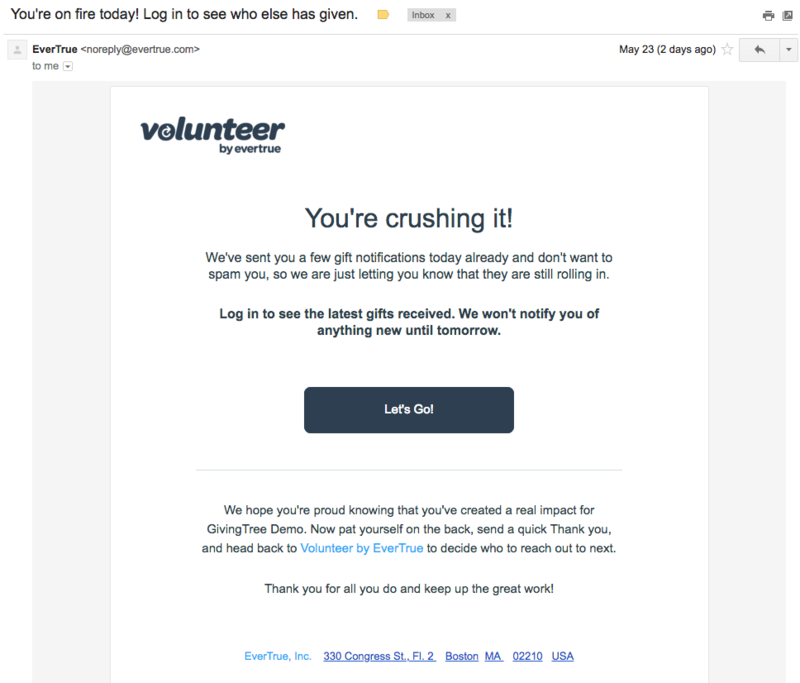 Volunteers will receive three email and/or push messages before receiving a throttling notification letting them know that we will not send any more communications for the next 24 hours and they should check the web portal to view any additional gift notifications. Notifications in the web portal can be found under the bell icon in the upper right corner. This is to prevent any spamming of a user's inbox or phone.